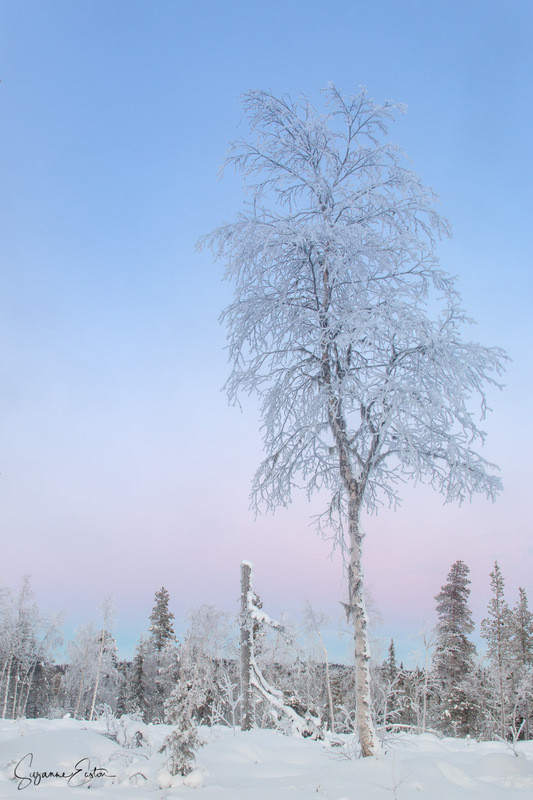 An air temperature of -22°C - colder than you can imagine, but crystal clear skies combine on the roadside in Sweden. Water droplets condensed on the trees as the night time temperature plummeted even lower. Now in the early afternoon sunset, this sugar coating on the trees glistens to give a fairy tale appearance. The pink sky has a deepening blue band, the Belt of Venus, growing from the horizon as the shadow of the earth engulfs the landscape for another day. Another Arctic night is just hours away and by the morning the hoar frost will be a distant memory. The snow lies knee deep on the side of the frozen road, compacted ice replaces the summer tarmac, tyres changed for the winter months to address the changing landscape. Pristine and smooth the snow coats everything in an undulating layer only disturbed by the footsteps we choose to make.